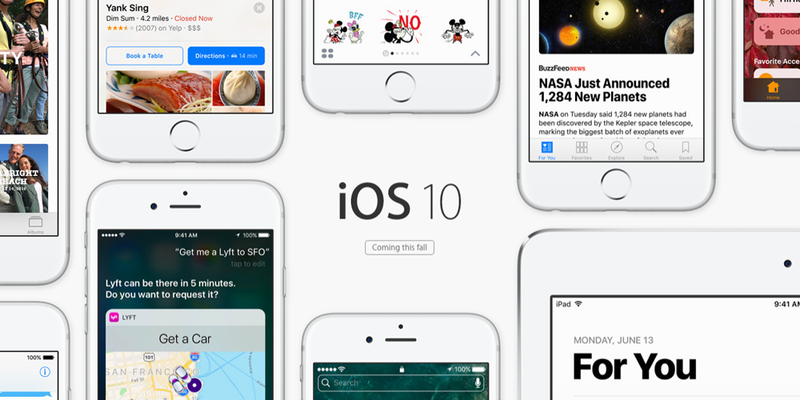 As is typical, Apple unveiled iOS 10 in June of 2016 during its Worldwide Developer Conference, releasing the first developer beta on the same day. iOS 10 includes a host of new features and interface changes, including new Message features, widgets, a redesigned Control Center, a new Music app, and much more. Headlining the iOS 10 update are a variety of new features coming to the Messages app. Users now have the ability to send messages with effects like “Slam” or “Invisible Ink,” while they can also send them with a background like Shooting Stars, Confetti, or Balloons. There’s also support for a GIF keyboard, a new image selection interface, and easily sending Apple Music songs. Additionally, iOS 10 includes a redesigned lock screen. Gone is the iconic “Slide to Unlock” message. Instead, users are now told to “Press home to unlock,” which Apple says will ensure that users are no longer blowing past notifications that they need to see. There is also support for widgets in iOS 10, which can be accessed by swiping to the left on the lock screen or homescreen. Widgets show brief snippets of information like Activity progress, Reminders, and Stocks. Photos has also received a major overhaul. Advanced Computer Vision brings insanely accurate object, scene, and face recognition, while it also searches locally on device to search photos for Memories to resurface trips and highlight certain dates. The Music app also received an overhaul in iOS. The Connect tab is nowhere to be found, with Connect content now being integrated into the For You tab. There’s support for lyrics at long last, as well. In terms of design changes, the fonts are much bigger and bolder and the Now Playing screen has also be refreshed. iOS 10 is currently in developer beta and will launch in public beta in July. The operating system will launch to the general public alongside the iPhone 7 this fall. Automatic Downloads is a feature in iOS 10 that is on by default and helps your iPhone, iPad, or iPod touch to automatically stay on top of installing the latest available apps and more.